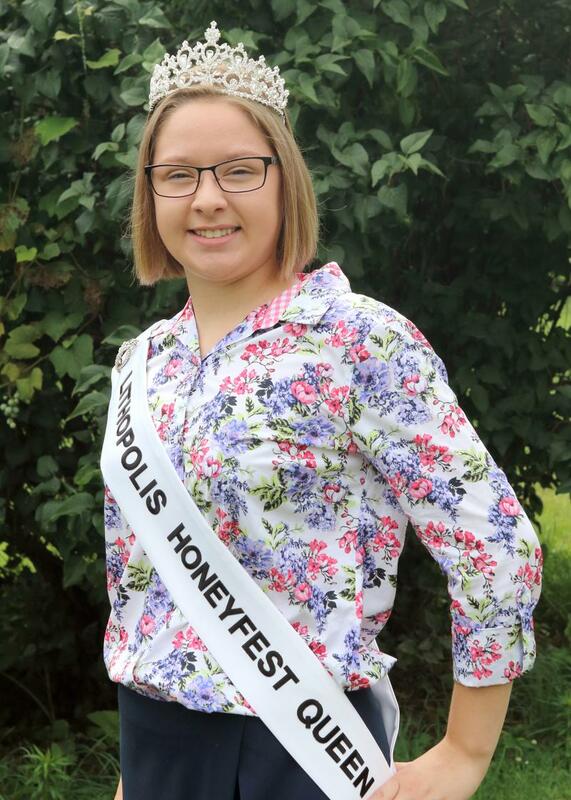 Catherine Parker was selected as the 2018 Lithopolis Honeyfest Queen. Catherine desires to raise awareness of the Lithopolis Honeyfest as part of a larger effort to help save Ohio’s important pollinator, the honey bee. She is looking forward to visiting different events and sharing her love of beekeeping with fellow Ohioans. Catherine (17), is the daughter of Teresa and Michael Parker, and the fifth of sixth children. As a senior at Big Walnut High School in Galena, Ohio, she actively participates in crewing, swimming and church youth group. She has a wonderful singing voice and has competed as part of her high school choir at the state level. Catherine has also played tenor drums in a bagpipe band. The beekeeping adventure began early for Catherine. At age 10, she attended the Central Ohio Beekeepers Association (COBA) beginning beekeeper course with her parents. She helps take care of the family's numerous hives and has a special interest in breeding Queens. In early spring and summer, it is not unusual to see Catherine helping Teresa catch a swarm throughout Central Ohio. Her drumming experience is useful when she "tings" an active swarm to land lower on tree branches making retrieval easier. "Tinging" involves drumming a pot, or as Catherine does, a Weber grill lid. The gong created somehow entices the swarm to group lower on trees or structures. Catherine has been featured in the local news for her beekeeping activities. She also volunteers for the COBA exhibit at the Ohio State Fair to help raise awareness of the importance of bees to the environment, building bee-friendly habitats and helping others get stung with the beekeeping fever. Catherine feels privileged to serve her community and to share her passion about honeybees. 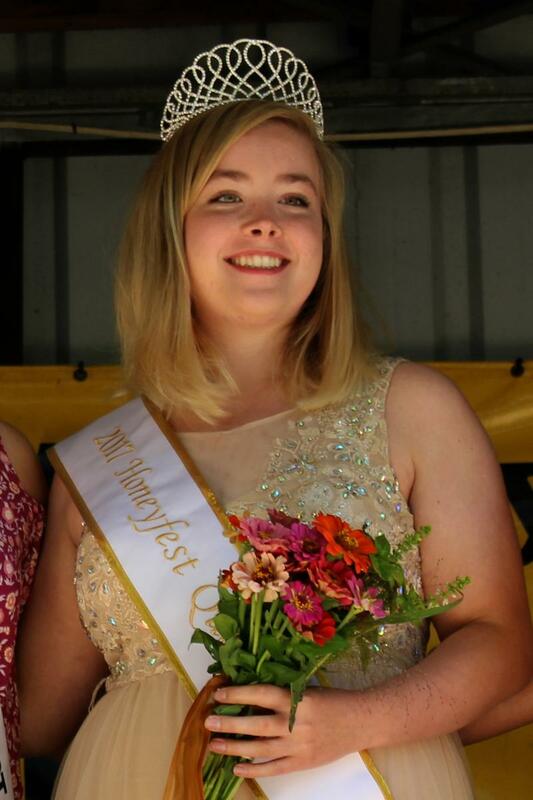 Tess Conrad was selected as honeyfest queen to help spread the word about our wonderful festival. Tess is the 20 year old daughter of Mindy and Jeffrey Conrad of Canal Winchester. She graduated from Canal Winchester High School in 2016 and is attending Ohio Dominican University. Tess started beekeeping at the age of 10 at her grandfather’s side. She now has hives of her own and has won many county, state and national awards for her many beekeeping talents, including photography. As one of her promotional events Tess spent a week at the state fair with the Ohio State Beekeepers Association talking to the public about honey bees, giving demos on beekeeping and of course promoting the Lithopolis Honeyfest. The Honeyfest Committee hopes to have a new Honeyfest Queen crowned each year to promote beekeeping and the festival. Look for information about becoming the next Honeyfest Queen on our website right after this years Honeyfest.